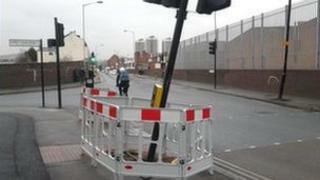 A 13-year-old girl has been killed in a crash involving a car being pursued by police in south-east London. Police said a Peugeot 308 and a Volkswagen Polo were involved in a collision in Ilderton Road, New Cross. The Peugeot was being followed by a marked police car when the crash happened at 18:24 GMT on Sunday. The teenager, who was in the back of the Polo, was travelling with her parents and brother. She was pronounced dead at the scene. Police said the patrol car had its sirens and flashing lights switched on. A spokesman said the teenager's mother, father and brother were taken to hospital but were not thought to have serious injuries. The male driver of the Peugeot was arrested and taken into custody. A female passenger was taken to hospital with minor injuries. Commander Tony Eastaugh said: "An innocent family are now dealing with the tragic loss of a loved one. "The Metropolitan Police has now begun a thorough investigation into the circumstances of this terrible incident. The thoughts of our staff and officers are with the family at this time." The Independent Police Complaints Commission (IPCC) has been informed and has sent an investigator to the scene of the crash. Speaking in Parliament, Home Secretary Theresa May said: "Could I also extend my sympathies to the family of the 13-year-old girl who died following a traffic accident involving a police patrol car on Sunday night." England marks St George's Day - or does it?